An artist's impression of AP Land's mixed residential and commercial development in Changshu, China. ASIA Pacific Land Bhd (AP Land) is on a regional brand building and expansion exercise in the property and oil palm plantation sectors to widen and diversify its earnings base. With property projects worth RM1.5bil in Malaysia, China and Japan in the next three years, the company is well positioned to raise its profile as a regional property player. AP Land's venture into the agriculture sector last year is also part of the company's strategy to build up a stronger earnings base. The company made two acquisitions of oil palm plantation land totalling 36,000ha in late November last year and January this year. The land will be fully planted over a four-year period and the first revenue will start streaming in by 2011. “We would like to strike a healthy balance in our portfolio of investments. Our portfolio currently comprises the two main divisions – property and oil palm plantation/agriculture. “Through prudent and resourceful management, we should achieve sustainable growth in both divisions in years to come,” joint managing director Low Su Ming told StarBiz. AP Land has set out to build a strong plantation division to take advantage of the high crude palm oil price and demand in the global market. Its long-term plan is to expand the company's plantations to 100,000ha in the next four years. On the property business, Low said AP Land's maiden ventures in China and Japan would not only enhance the company's future earnings but also its profile as a regional property player. With the sale of City Square Centre to Australia's Macquarie Global Property Advisors in the middle of last year for RM680mil and the settlement of RM350mil debts, the company is leveraging on its surplus cash position to pursue investment opportunities. “With its debt-free status, AP Land is well positioned to seize good opportunities that may arise. “We will grow according to the fundamentals of how we operate our business – the goal and objective is to grow shareholders' value, and the properties and projects that we invest in must perform and deliver,” Low said. She said although the current global uncertainties, compounded by the high inflation and fuel prices, would dampen consumer and investor sentiments in the short term, “we remain confident this will only be temporary”. Although the company is pursuing its overseas ambition, Malaysia will remain its mainstay. “We do not want to put all our eggs in the same basket and having other overseas projects will be a cushion against any sudden market uncertainties. “Diversifying into new markets will provide AP Land with another source of revenue if the Malaysian property sector moves to a lower gear,” she added. Citing China, she said although growth had slipped from a high of 11% to 8% now, it was still a commendable rate. “The Chinese government is closely monitoring the country's economic expansion to ensure it is based on sustainable growth policies and objectives to avoid any overheating. “We see huge opportunities in China, especially in the third-tier cities. We are planning for more viable projects to make a bigger presence there,” Low said. AP Land's maiden property project in Changshu, China, will take off in August with the launch of three-storey shop houses. The three-phase project will comprise a mixed commercial and residential development of shop houses, offices, small office/home office (soho) units and apartments worth a gross development value (GDV) of 800 million yuan. The project will take three years to complete. The 16.16-acre plot was acquired late last year from China's National Land Resources Bureau for RM46mil. It is located about 100km northwest of Shanghai. Changshu is a third-tier city where a number of large multinationals from Taiwan and Japan have manufacturing operations. AP Land, which recently acquired a piece of freehold land in Hokkaido measuring 3,082 sq m for RM18.9mil, will make its debut in Japan's real estate market later this year. It is embarking on a niche boutique high-end residential development in the upcoming ski resort of Niseko, located in northern Japan. The project will generate an estimated GDV of 5.7 billion yen. VENTURING into niche property projects with short turnaround time will be the focus of Asia Pacific Land Bhd (AP Land) under its new brand building initiatives. “We are positioning our business and development strategy in clearly market-driven property projects that will stand out in terms of product differentiation and branding,” said joint managing director Low Su Ming. AP Land is on the lookout for strategic land to undertake more high-end projects and is in the final stages of acquiring a piece of land in the Kuala Lumpur city centre for a small office/home office (soho) project. Low said that despite the uncertainties in the economy, the fundamentals in the property market remained sound. “There is a growing niche market of high net worth individuals who are looking for good opportunities to buy quality property products that can enhance and complement their lifestyle. “We believe choice properties in strategic locations with high potential to value add will be more resilient to a market downturn,” she said. Projects lined up include MyHabitat Tower 2, a 38-storey tower comprising 215 condominium units with a gross development value (GDV) of RM220mil in Kuala Lumpur, and 80 high-end villas with a GDV of RM40mil in Bandar Tasik Puteri near Rawang. AP Land's 2,670-acre Bandar Tasik Puteri still has 1,500 acres to be developed over the next eight years. The company is planning for more upmarket lifestyle products in the township for future launches. The third nine holes at Tasik Puteri Golf & Country Club (TPGCC) in Bandar Tasik Puteri have just been opened while the clubhouse extension and upgrade will be ready by the third quarter this year. The site of AP Land's Penang Island Bay Resort in Batu Ferringhi. 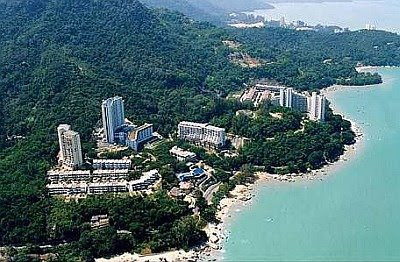 AP Land is now putting the final touches to the Penang Island Bay Resort, its luxury residential project with a GDV of RM400mil in Batu Ferringhi. The project is scheduled for launch next year. “We are creating a niche product for the discerning and affluent group, especially expatriates looking for top-class property in the region. “It will be a benchmark development in Penang in terms of exclusivity,” said executive director B.S. Wee. The eco-friendly residential project will comprise resort bungalows, villas and high-end apartments in an exotic “back-to-nature” setting. The hillside project has lush greenery and views of the Andaman Sea. Wee said to promote a green and sustainable development, much effort would be expended to retain the project's natural terrain and land clearing would be minimise. “The development will give priority to sustainability and management of the environment by adopting best practices that will maintain the natural terrains. “It is a low-density project with only 172 units to be developed on over 40 acres,” he said. Conceptualised and landscaped by a renowned Australian architect, the residences are designed with space, serenity and resort-like atmosphere to create an exclusive haven. “The project will enhance Penang's image as a preferred destination for leisure and retirement. “This is in line with the state government's initiative to promote Penang as a choice destination under the Malaysia My Second Home Programme,” Wee said. UNITED U-LI Corp Bhd, a maker of light fittings and cable support systems, expects higher profit margins this year as it benefits from rising steel prices. Steel prices are hovering at RM4,000 per tonne, the highest in history, compared with RM3,200 per tonne some three months ago. "The selling benchmark is better than last year's. Normally, we don't stomach the higher raw material cost. We pass it on to end customers," group managing director and chief executive officer, Datuk James Y. W. Lee told Business Times in an interview. The company is optimistic it will continue to register high profit margins because of the cost mechanism. "We are projecting 20 per cent growth in revenue this year and profit would grow in tandem with sales as we grow the local and export market and from higher selling price," Lee said. U-Li makes building materials, integrated ceiling systems, steel roof battens, light fittings and cable support system for the housing and building construction, oil and gas, transportation, telecommunications and water industries. For the fiscal year ended December 31 2007, it posted a net profit of RM10.25 million on the back of a RM145.6 million revenue. For the first quarter of 2008, its net profit and revenue doubled to RM4.5 million and RM42.4 million, respectively. Seventy per cent of the profit and revenue came from its local operation. "We expect the growth momentum to prolong until year-end. We usually have up to RM80 million worth of contracts in hand at any one time to support the business," Lee said. According to the company's annual report, its compounded annual growth rate over the last five years has been 20 per cent. "We expect to replicate the past with double-digit growth. Steel prices are not stable. We expect it to increase, which would translate to more revenue. So rising raw material cost is in our favour. We always turn recession into opportunity," Lee said. "Downstream activities have a good chance to increase selling price," he added. Industry players are predicting that steel prices will hit RM5,000 per tonne by year-end, marking another new high. "Our expansion will come in a year or two from now. Right now, we want to concentrate on business development," Lee said. The government may call for tenders for the Gemas-Johor Baru railway project by the year-end, says a government source. A source from the Ministry of Transport said it was in the government's interest to complete the southern portion of the country's electrified double tracks. "The government will call for tenders, but this is subject to the mid-term review. "The single tracks are now running from Singapore to Kuala Lumpur and from Kuala Lumpur to Butterworth. So the whole stretch of the double tracks must be completed to improve efficiency," he told Business Times. An industry source said that DRB-HICOM Bhd and IJM Corp Bhd may bid for the RM8 billion contract to lay new rail tracks connecting Gemas in Negri Sembilan to Johor Baru. DRB-HICOM, a car and banking group that also has expertise in engineering, is expected to submit a detailed proposal comprising design, layout and cost structure to the government in the second half of the year. "DRB-HICOM is keen to work on the double tracks. They may either work with a local or foreign party in securing the contract or bid for it on their own," the source said. The source said DRB-HICOM had previously made a presentation to the government for the project late last year. Key executive officials of DRB-HICOM were not available for comment at press time. The project involves building over 200km of parallel railway tracks, including stations, depots, halts, yards and bridges. Work will also cover systems such as electrification, signalling and communications. Both DRB-HICOM and IJM are experienced in railway work. IJM is one of three sub-contractors for the RM3.45 billion Seremban-Gemas double-tracking railway project. IJM managing director Datuk Krishnan Tan Boon Seng, however, told Business Times through e-mail that IJM was not involved in any submission for the Gemas-Johor Baru stretch. DRB-HICOM, meanwhile, was a main contractor for the RM4.6 billion Rawang-Ipoh double-tracking project awarded in 2000. However, the project faced delays and the government eventually asked UEM Builders Bhd to complete it. The Rawang-Ipoh project was finally completed last year. Malaysia's other double-tracking project is the RM12.5 billion rail link between Ipoh and Padang Besar. This is being done by Gamuda Bhd and MMC Corp Bhd, and slated for completion in 2013.